Welcome to The Sean O’Casey Season! Welcome to Irish Repertory Theatre’s 30th Anniversary Celebration: The Sean O’Casey Season! We are presenting a comprehensive retrospective of the work of renowned Irish playwright Sean O’Casey. 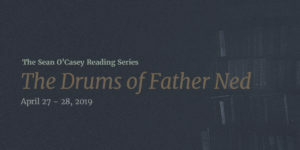 The season features The O’Casey Cycle – O’Casey’s renowned “Dublin Trilogy” in repertory: The Shadow of a Gunman (1923), Juno and the Paycock (1924), and The Plough and the Stars (1926) – and free readings of all of O’Casey’s other plays in The Sean O’Casey Reading Series. Other events include symposiums, film screenings, musical evenings, and two exhibitions. Sean O’Casey’s The Plough and the Stars inspired the first collaboration between Irish Rep founders Charlotte Moore and Ciarán O’Reilly; we are delighted to return to the work that started it all in The O’Casey Season – Irish Rep’s most ambitious project to date! O’Casey Season partners include Shivaun O’Casey (daughter to Sean O’Casey), Neil Pepe (Artistic Director, Atlantic Theater Company), the New York Public Library for the Performing Arts, Dr. Maureen Murphy (HOFSTRA University), Robert Lowery (Sean O’Casey Review), and more. JUST ANNOUNCED: Due to popular demand, the O’Casey Cycle was extended by 4 weeks! Don’t miss your chance to see all three productions of our acclaimed O’Casey Season! Book now! Extended to June 22, 2019!